What is Asbestos Cement and Is it Dangerous? Asbestos cement is a type of construction material used extensively in the past. This building material became popular in construction due to its strength, durability, and the fact that it could hold up under practically any type of weather conditions. Additionally, asbestos cement can withstand fire as well as water. Due to these reasons, and the fact that asbestos was mined extensively throughout Australia, asbestos cement can be found within many structures around the country. Comprised of approximately 15 percent asbestos fibres mixed with cement, asbestos cement can still be found in a variety of different types of construction. One of the most common areas where asbestos cement can be found is in roofs. Asbestos cement roofs are primarily comprised of large sheets of asbestos cement. They may commonly be located in agricultural and industrial buildings, but this material was also used in roofs for sheds and garages. Asbestos cement may also be contained in wall cladding as well as downpipes, gutters, and cement flues. While asbestos cement was used extensively up to the mid-1900’s, it was not until the 1970s that this building material was banned. The ban was instituted after it was found that asbestos contained dangerous toxins that could prove to be fatal. It is now known that exposure to asbestos, including asbestos cement, was responsible for mesothelioma, which is a form of cancer for which there is currently no cure. Individuals who worked in factories where asbestos was used first began to display symptoms of mesothelioma. It was later found that anyone who is exposed to this material is at risk for becoming ill. Due to the fact that this particular form of cancer tends to have a long period in which it remains latent before symptoms appear, most people who contract it are not diagnosed until the disease has advanced. Consequently, the survival period for mesothelioma is generally low. While a block of asbestos cement typically does not present any danger if it is not damaged, if it becomes broken or cracks, small pieces of asbestos can be released into the air and breathed in by occupants. Unfortunately, unsuspecting victims may not discover until many years have passed that they have been exposed to asbestos and become ill as a result. For this reason, it is imperative that asbestos cement be carefully removed to eliminate potential risk. If you are concerned that your home, office or commercial building may contain asbestos cement, it is important to have your property inspected. In many instances, it will be possible to detect the presence of asbestos cement by visual identification. Asbestos cement often has a grey appearance, much like regular cement. In some cases, the material suspected of containing asbestos cement may need to be tested in order to determine whether it actually contains asbestos. It is imperative that only an experienced asbestos analyst conduct such tests in order to mitigate risk of exposure. 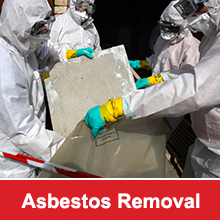 If asbestos is found, it will need to be removed using special procedures. 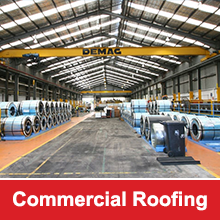 We specialise in the removal of asbestos in large buildings and the construction of a new metal roof to replace it. To find out more information about this service, contact us today by giving one of our helpful team members a call or via the contact form on our website.